Wow, it has been a really long time since I’ve posted anything worthwhile. I bet you all thought I was abducted by aliens or something. I assure you that I’m still here and I’m still writing. As you may have learned from earlier posts, I have been trying to create more tension between the various characters, especially for the two main characters, Jori and Hapker. I’ve been trying to deepen the plot and to add more suspense to each of the chapters. Lately, I’ve also been making a lot of name changes in an attempt to have the character names relate better the various Earth cultures. I’ve also realized how much some of my characters are too close to the Star Trek: The Next Generation characters. So I’ve been trying to change some of their characteristics and histories. Because of this parallel and because one of my editors insisted I make the crew members more militaristic, I’ve changed the dynamics of how the Alliance works. It is now called the Cooperative, by the way. And instead of one aspect of the Cooperative that was similar to the Federation of Star Trek, I’ve created two distinct aspects of the Cooperative: One that is more diplomatic and service-oriented in the form of the Prontaean Colonial Cooperative (PCC) and one that is more militaristic in the form of the Prontaean Galactic Force (PG-Force), both operating under the Prontaean Cooperative for Galactic Synergy & Security, aka PCGSS or PCgus. Since I don’t want a militaristic crew, Hapker is part of the PCC. Can you believe this story was started four years ago in July, 2014? Each time I think it’s done, I realize it needs more work. Then there was the complete and utter bashing by a content editor in 2017 that disheartened me for many months. Now there is a better reason as to why it has been taking me so long to get this book published – family. When I started writing this book in 2014, it was just me, my husband, and my two dogs. Then in 2016, we became foster parents. We started out only fostering one child and for only short-term periods (called respite care). But in April of 2016, we agreed to foster two teenage kids and for a longer-term period. That period was only supposed to be a month, but then it turned into two, then four, then six. And the day before Christmas 2017, they asked us to adopt them. We said “Yes!”, of course. This was also the date we brought home a two-year-old boy we adopted from China. Even though we had the two teens for a while, our status from a two-person family to a five-person family officially changed on December 24th, 2017. And I couldn’t be happier! As you can probably surmise, our lives have changed dramatically and I have very little time to work on my book. But never fear. I still find the occasional time. My teens are back in school and my two-year-old, who just turned three, still has nap times. So please subscribe and look for new posts. One way or another, I will continue to write and finish this book! So you have a story in your head and you suddenly feel inspired to write it. You sit down and you open a Word document. The story flashes through your head. The action, the heartache, the drama. But where do you start? How do you start? Suddenly you’re overwhelmed. While some writers can simply start writing by the seat of their pants (called pantsers), some of us need a little more structure and guidance. If you are one of the later, here are some tips on where to begin. If you’ve been thinking about your story for some time, you may already know who your characters are. You may also know things about them such as what they look like, where they work, their strengths and weaknesses, and so on. Either way, you need to create a character journal with all their information. The more important your character is to the story, the more thorough this journal should be. This is something else you might already have in mind. Creating a journal about it will help you fine tune it. A journal is also a great way to keep track of details later on as you write your story. If you’re having trouble just sitting and writing, having a story structure can help. The first structure you need to consider is the three acts basic acts that most good stories should have. The acts also help you determine your overall plot. The first act establishes your setting and characters, and then brings about the inciting incident. 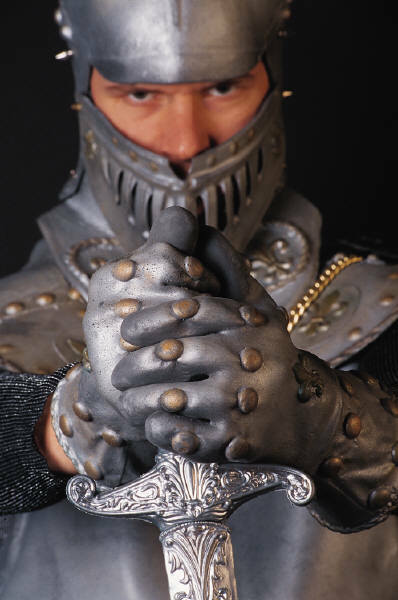 The inciting incident is the event that rocks your character’s boat, the even that calls for his or her intervention. This incident can be something as simple as a death of a family member to something as cataclysmic as an explosion wiping out half a city. The second act consists of your character trying to resolve the situation only to find it’s not easy. Two steps forward, one step back. The third act contains the climax and the final wrap-up. I have only given the basics of the three acts. If you’re having trouble with this, there are a ton of books and free online resources that can help. An outline is not the same thing as the story structure described above. The outline consists of the story structure, but it is much more detailed. It doesn’t just help you with your timeline, it also helps you establish important scenes, show you where gaps are, and gives you something to refer to as you write. I have written an article previously on how using index cards helps me establish an outline – Outlining Your Novel with Index Cards. Make it fun with colored index cards! This can be a tricky one. Before you write, you really need to know how you plan on telling the story (or showing it, I should say). Here’s an article titled, Point of View Writing. It gives the basics and in an easy-to-understand way. The article states that Third Person, Limited is the most common point of view in fiction. I agree. And it is the point of view I use. I find it the easiest to use and the easiest for readers to fall into. But whichever you use, be sure you are consistent. There are only two choices in writing tense: past tense or present tense. One would think that writing in present tense would be best because it establishes the immediacy of what’s happening. But past tense can work just as well. For some reason, I tend to do my outlines in present tense, but write my novel in past tense. Whichever you choose is fine, just be sure to be consistent. The Write Practice has another great article regarding writing in past tense versus present tense. This can still be the hardest part. But a friend and fellow writer posted something on her blog recently – Write Bravely. What does it mean? It means write and don’t worry too much about what others think. Don’t worry if your point of view or tense is off or whether you have enough descriptions in your scenes. Just write. You can worry about all that other stuff later. If finding the time is a problem, make the time. Give up a television show or two. See if your significant other can help take up a chore or two. Even an hour a day is better than nothing. You’re story is never going to get written if you don’t make the time. Here are 10 Ways to Create More Time in Your Day. Try not to look at novel as one big huge project. Big projects are easier to complete when you break them down into smaller projects. Use the headings I’ve used in this article as mini-projects. Even the heading Write can be broken down. Just take it one chapter at a time. One chapter at a time and you’ll get there. Good luck! I’ve submitted my sci-fi novel, StarFire Dragons, to several beta readers and their feedback has been exceedingly helpful. Beta readers are readers who look for loopholes, point out spots that are confusing, comment on whether the pace is too slow or too fast, suggest ideas for plot movement or character improvement, and so on. Beta readers do not edit for grammar, punctuation, or spelling (unless they want to). In many cases, several people pointed out the same issues. This was helpful because it showed me something really needed to be fixed. In other cases, only one person pointed out a certain issue. This was also helpful because sometimes it was just something that other readers missed. Here are the most common issues people found in my science fiction story. Chapter 1 starts out with action. Some of my readers loved this while others did not. The ones who loved it said it really hooked them to get into the action. The ones who didn’t pointed out that a story should start with scene and character introductions. In other words, start the first chapter in the protagonist’s normal world. I can see how this would be important, but I am at a loss as to how to hook the reader with a normal situation. Also, I decided to rewrite the first chapter and present it to new beta readers and was told it was too boring. Obviously, this is a case where I’ve received conflicting information. I can either decide to just please one set of readers or I can see if I can try to find a way to please both. The way to please both would be to show J.D.’s normal world, but in an exciting way that hooks the reader. Thoughts? This is another one where I received conflicting information. Some beta readers said I introduced too many characters at once while other beta readers wanted more information on each of the characters as they are introduced. A suggestion to fix this problem would be to only vaguely introduce the characters in chapter 1, then add to their characteristics as the story progresses. Thoughts? Some of my beta readers said I gave too much detail while others said I gave too little. I think this is more of a reader preference than it is an issue. The readers who said I gave too much said a close-third point of view doesn’t justify lots of detail. They also said that today’s readers can easily fill in the blanks. The readers who said I gave too little felt the characters were too faceless. They said they couldn’t feel the scene as well because it was never described. While I myself prefer to fill in the blanks, many people prefer more detail. So my choice is between not giving enough detail to readers who like detail or giving too much detail to readers who don’t like detail. I choose to give more detail. And perhaps to avoid giving too much detail, I should try to be brief but very descriptive about the detail. I should try to convey emotions with the detail. And I should try to convey the detail using other senses besides sight. A few beta readers did not like Mik Calloway’s character. They said he was too cliché for a bad guy. I agree. I’m not very good at writing bad guys. I’ve decided to fix it by making him a little more personable. Although we still hate him, it will help us understand him better if I provide a better explanation as to why he hates Tredons so much. Any other ideas? Many of my readers felt that the scene where Jori cried in J.D.’s arms really hit the spot. But one beta reader said it felt forced. The situation forced Jori to warm up to him rather than it happening organically. I kinda see the point. I tried to make it show organically when Jori was upset that J.D. called him a brat. This, to me, showed that Jori actually cared about what J.D. thought of him. So, I think I can expand on this a little more so that when the connection scene does come, it doesn’t come across as too fake. I tend to write very formally. And as such, my sentences tend to be about the same size and the same structure. This was noticed by a few of my beta readers who are aware that sentence lengths should vary because it helps with the story pacing. Short and choppy sentences can indicate a fast paced scene while longer sentences can help provide the pacing for slower scenes. Many of my beta readers pointed out that all my characters talk the same. This is not at all realistic, especially in a futuristic world where the races and cultures are even more diverse. I tried adding a different way of speaking for Lt. Jenna Stein, but it turned out to be more confusing for people. So I need to think of a way to make my characters speak differently without trying to write out annoying accents since today’s readers don’t like reading accents. There are a few ways I can vary the way a character speaks without writing annoying accents: different sentence structures, different sentence lengths, different words, odd speech habits, swear words (which I succeeded at with Terk), jargon, characters who repeat themselves, characters who over- or under-explain, and probably many more I haven’t thought of. I plan on keeping Stein’s use of the word “be” the same even though some of my beta readers were thrown by it. I think they were thrown because Stein was the only one who talked differently. If I make other characters talk differently, it may not be as noticeable. I plan on having Lt. Chandly use more jargon. Lt. Commander Bracht seems like a guy who would speak shorter sentences. The captain as well, but he always speaks much more formally than Bracht. Some other character may use the word “um” a lot. I’m still deciding on others. A few of my beta readers felt J.D. was too weak of a character. One beta reader specifically said that Jori seems to be a much better developed character than any of the others and it would really make the story better if J.D. and perhaps even Captain Arden were just as compelling. I agree. I keep trying to make J.D. more interesting, but for some reason I am having a hard time. Suggestions? Almost every single one of my readers thought this story had the feel of Star Trek. This was intended because I thought it would make it easier for readers to relate to the setting. But it turns out that many of my readers was annoyed by this, especially since some characters, like Bracht, were too similar. They wanted to see a different world with different people. While I don’t want to deviate too much from the world I’ve created, I do understand the need to be a little different. Thoughts? One beta reader felt the story should end at chapter 30 because it left the reader hanging and inspired them to read the next book. I don’t know about you, but I hate it when a book leaves me hanging. I tried to inspire the reader to read the next book in the series at the very end, chapter 33, but I’m not sure I did a good enough job. I need to work on the ending so that it concludes the first book but still inspires readers to read the second book. My main intent of writing Part One – First Encounter of the Kavakian Empire is to introduce the primary characters. However, the story still has to have a plot, otherwise it is pointless to read. To define the plot, I need to determine the goals of influential characters. The plot arises when those goals clash. Let me review the goals here. The goals of each character are listed in the order of importance. Make sure his brother Terk lives. Appease his father (more on this in future chapters). Keep their real mission secret. Avoid war with the Tredons. Get Jori and Terk home safe as promised. Make sure Jori and Terk are not a security risk. Verify the Grapnes’ intent and determine if there is any truth to their claims. Determine if the Tredons had a secret mission. Make a good impression on Jori and Terk in hopes of future dealings. Make friends with Jori so that their time together is not unpleasant. Make friends with Jori in order to find out if Tredons had a secret mission. Keep Jori from being a security risk. Keep Jori’s identity a secret from other crew members. Keep Jori and Terk from being a security risk. Revenge and/or sabotage against Jori and Terk. With these goals in mind, where do they clash? The first one you might notice is that Jori wants to appease his father somehow. After all, their mission is nearly a complete disaster. He and his brother lost their crew, their ship, and their cargo. All they have left is information for their father, but that will hardy be enough to make up for their failure. So what will he do? Will his choices clash against the other characters’ goals of preventing him from being a security risk? Jori also has a secret to keep. How far will other characters in this story go to find out this secret? Another area where the goals clash is between Captain Arden and the Core Alliance. The captain has promised not to allow any harm to come to Jori and Terk, promised not to take them prisoners, and has promised to get them home safe. The Core Alliance, however, may have something else in mind for Jori and Terk. Lt. Commander Bracht is obviously an antagonist of sorts, but the real antagonist in this story is Lt. Calloway. He will do his duty well enough to keep from getting into trouble. But if he can get away with doing something against Jori and Terk, he will do it in a heartbeat. His goals clash with Jori’s goals as well as with the captain’s goals. The main plot of this story concerns the potential for war between two enemies. While it is obvious that Captain Arden wants to avoid war, we are not yet sure if Jori is interested in the same thing. So far, he is cooperating. But what will happen if his brother dies? Part One can end in two different ways. It could point towards a potential for peace between the Core Allliance and the Kavakian Empire. Or it could end in disaster with the Kavakian Empire being an even greater enemy threat to the Core Alliance. Keep reading the Kavakian Empire to find out more. 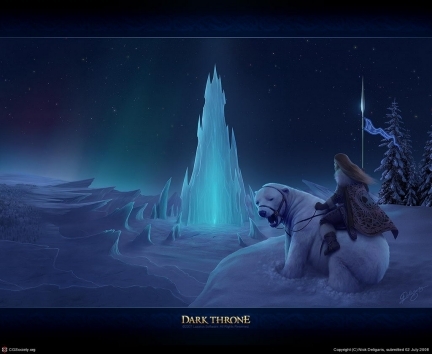 In previous posts, I told you how I came up with the story and characters for “The Guardian of Destiny”. I showed you how I started out with just the basics and let my story grow from there. That is how I did it, but how can you implement my process and make it your own? It all starts with an idea. Maybe you did a writing exercise that seemed to take off. Perhaps you watched something or read something that left this exhilarating feeling in your gut. This is where you start. Meditate on whatever it was you saw or wrote that seemed to resonate so well. What is it specifically that got you excited? Was it the dynamics of the characters in the movie you saw or the book you read? Was it the way the story was told, the intricacies of the plot, the ending? If you got this feeling through a song you heard, what were the images you saw when you heard the song? What feelings did the song bring? You need to take these abstract feelings and put them into words as best you can. This way, it will be easier for you to recapture it whenever you need the inspiration. Putting these feelings down on paper makes them more real and helps you to build your characters and your setting. There are no hard and fast rules when you develop your story. At this point, it is perfectly okay to let your imagination go wherever it wants to go. Write it all down. You can write randomly as your ideas pour out or you can organize your thoughts using note cards. Not all your ideas will be used. You will find that as your story grows, some things will need to be discarded and other things will need to be added. Once I get a basic idea of the plot, characters, and setting, I like to organize my thoughts. I dedicate a binder to the story. And then I start by writing about my main characters; what they look like and their basic personality traits. After that, I describe my fantasy world. At this point, neither my characters nor my fantasy world are set in stone. I want to give myself the freedom to change things, should the story require it. I like to use note cards to organize my story. I start out with broad ideas. Then I write down ideas for specific scenes. And if I already have a very specific scene in my head, I write it out on paper and use the notecard to reference it. Using notecards makes it easier for me to delete scenes, add scenes, and change the order of scenes. 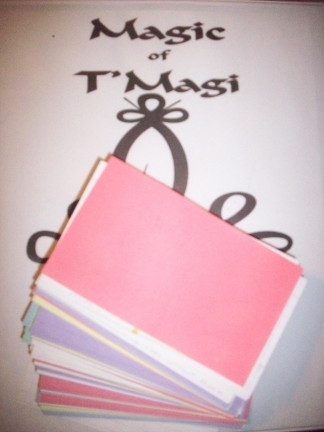 My color-coded note cards and binder for another story idea I have. As my story grows, so does the number of note cards. Sometimes I have to rewrite the note cards because my ideas get too large for just one card. Keep adding cards until you feel that you have an entire novel’s worth of a story. Then organize those cards so that each card represents a chapter or subchapter. If you need more space, use the notecard to reference a writing journal or binder dedicated specifically to this story. You don’t have to use these methods when you develop your story and characters. Do whatever is easier for you. The more you write, the more you will find out what works for you. Did you find an idea in your journal or through one of your writing exercises that you want to expand on? Then it’s time to sit down and create your fantasy world. Start with the idea that inspired you and daydream about it. Think about how your idea makes you feel and why it makes you feel that way. What is it about your fantasy world that makes it unique and interesting? Defining your world can be very complicated. Think about some of the basic characteristics of your world and its culture. You can develop it further as you expand on your story. Who is your main character? Start with the basics. What does he or she look like? What is the task he is going to accomplish? What are the prominent characteristics he needs to complete his task? Don’t worry if the character seems a bit bland at this point. As you write, his character will develop more. But the more you start with, the more deeply he can develop. Then think about your antagonist. Who is the bad guy? What does he or she want? What is his motivation? What does he look like? Consider the main supporting characters. Perhaps you have more than one hero. If just one hero, certainly he or she doesn’t act alone. Who aids him on his quest? What do they have to offer that he, himself, does not possess? This is probably the most important thing you can consider. You might have a good idea for a part in the story, but it all has to come together somehow. If you don’t have a plot, then anyone who reads your book will be thinking to themselves, “What is the freakin point?” Consider the book, “20 Master Plots“. For me, creating the fantasy world is the part about writing I find most fun. Although there are important components to think about, it doesn’t have to be technical. Be sure to write down and organize your ideas, though, so you can make sure you are consistent and for in case you need to set aside your story for a while. If visiting a new city or town, where would your character want to go first? A tavern, an apothecary shop, the shipping docks, or the palace, for example? What would your character do if confronted in a fight? Run, try to reason with the other person, pull out a choice weapon? If your character had to leave their small village would they be excited, nervous, or reluctant? What class do your characters view themselves and how do they view other people in different classes? If your character suddenly came into a lot of money, what would they do with it? Save it, buy some needed items, spend it all at once on extravagant items? Don’t just describe your character. Show the reader what they are like in four different ways. Action – Show your character doing something that reflects their personality. For example, if a drunk man is passed out in a tavern and his purse is visible and easy to take, will your character take it, try to wake the drunk man up to warn him, or ignore it and decide if the man gets his purse stolen it is his own fault. Speech – What your character says can reflect a lot about them. Do they prattle, do they speak intelligently, do they boast, or do they sound naive and gullible? Appearance – What does your character prefer to wear? Describe their posture and facial expressions. Thought – What does your character think about their surroundings? When your character watches other people do they pay more attention to the clothes they wear or to the weapons they might be carrying? Does your character walk into a tavern and pay more attention to how the barmaids look, how nice or rough the atmosphere is, if the tavern has decent entertainment, or if there are some gambling tables? Does what your character think conflict with how they act? For example, does your character hate nobility but behave reverently towards them? The more I learn, the better I think my writing will be. 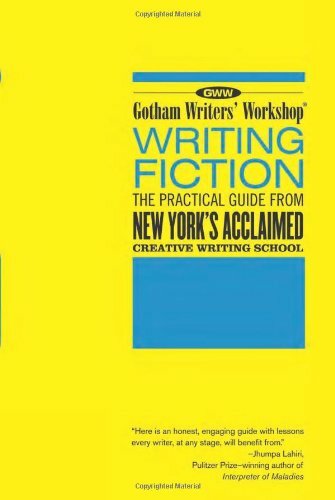 “Writing Fiction” from Gotham Writers’ Workshop has a lot of helpful information and some great writing exercises to try. Asking questions about your characters is just one of many fun writing exercises to try. How much can you show about your primary character in just a paragraph or two? Remember, show, not tell.